Enclosure: The Uromastyx can reach up to 18 inches so a set up of at least 5 feet by 2 feet will eventually be required. The substrate that is usually used would be washed playsand. Avoid thick or sharp sands when the Uromastyx is at a very young age, and set up their feeding dishes so that they are above the sand. 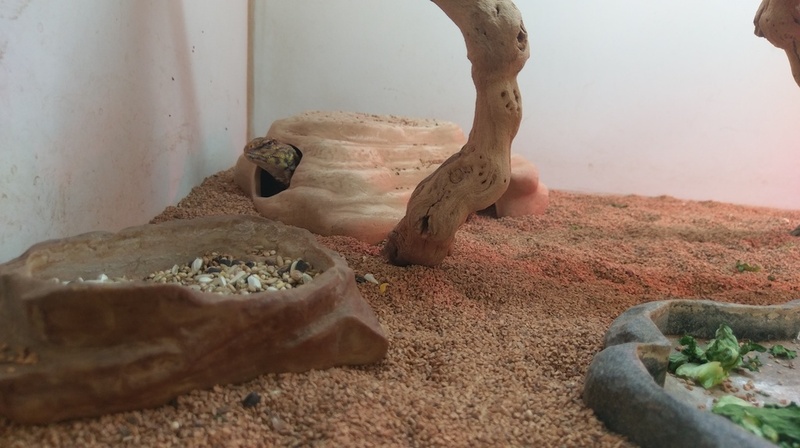 The playsand is also a great choice because the Uromastyx loves to burrow. Lighting and Temperature: The Uromastyx needs very high temperatures. The lower temperature range in the tank should be around 90F to 95F degrees and the basking spot should be at 120F degrees. Place a hideout in the cooler side of the tank to give the Uromastyx a place to retreat from the heat. There has been some issues with UVB lighting with Uromastyx in the past. There have been report of certain bulbs not providing the proper wavelengths that the Uromastyx need. Make sure you buy a credible bulb from a reputable pet store and provide your pet with calcium suppliments. seeds like sunflower seeds. As always, veggies can be given chopped up and in moderation..
Lifespan: A uromstyx will generally life from 10 to 15 years with proper diet and care.